This commentary originally appeared in Forbes on February 12, 2015. Texas has been a bright spot in an otherwise dim U.S. economy for years. Consider that Texas employs 1,444,290 more people than when the recession started in 2007, according to the latest state-level employment report; excluding Texas from the nation’s job creation equation, there are 276,290 fewer people employed in the same period. Rapid job growth helped lower the unemployment rate to 4.6%, which has now been at or below the national average and California’s rate for at least eight years. Critics claim this economic success is a facade based solely on high oil prices. With oil prices falling 55% since last June, they argue that the Texas model—a combination of low taxes, less regulation, and a sensible lawsuit climate—will show its true colors and collapse. While robust economic growth and job creation may moderate, critics are unlikely to get their opportunity to trash the Texas model (though they will try) because of a highly diversified economy and pro-growth policies that should be doubled-down upon during the current legislative session. 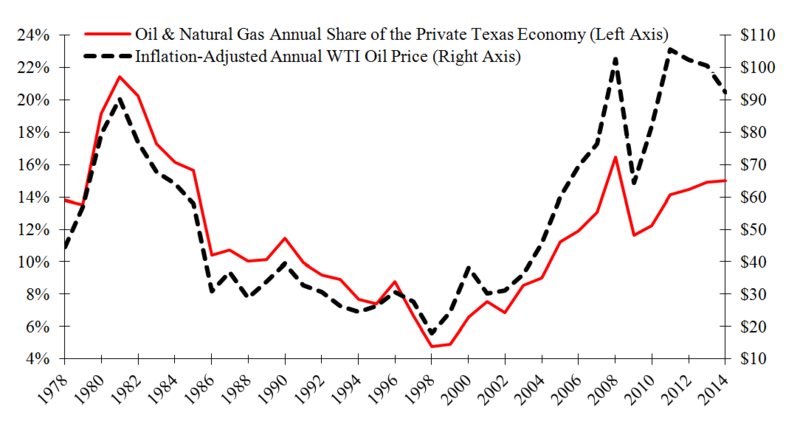 Things have changed drastically in Texas compared to when it was primarily an oil-producing state in the early 1980s. In 1981, the mining industry, the vast majority which includes oil and natural gas activity, was 21% of the state’s private economy, 5% of the labor force and 28% of total state revenue. These shares declined slightly for several years until inflation-adjusted oil prices tanked by 50% after the debacle with OPEC in 1986. Following the domino effect this had on the housing market and financial sector, the Texas economy was in disarray and net nonfarm jobs decreased by 90,258 (1.2 %). Texas’ economy today is more resilient to oil price fluctuations thanks to industrial diversification and pro-growth policies. From the economic devastation in 1986, there was a concerted effort by entrepreneurs and legislators to find ways to diversify the state’s economy. Eventually, the medical industry blossomed in Houston, Austin became the Silicon Valley of the South, and retail trade expanded in Dallas. This period of revitalization also included banking reforms, both legislatively and internally, and a host of public policies that eventually became the Texas model. There was also the added benefit of lowering trade costs from NAFTA in 1994 that helped increase exports; Texas has now been the top exporting state for 12 consecutive years with its top trading partners being Mexico, Canada, Brazil and China. As Texas diversified, the mining industry’s share of the private economy declined. Compared to 1981, the mining industry is now only 15% of the private economy, 2.7% of the labor force and 11% of total state revenue. Clearly, the state is less dependent on oil and natural gas. This is not to say that Texas will not feel the drop in oil prices. Many other industries depend on growth in the mining industry. In other words, there is a trickle down economic effect from oil and gas activity. My research finds that while diversification helps the state’s economy better withstand fluctuating oil prices, Texas is more dependent on the rest of the U.S. than before NAFTA. Fortunately, we have anecdotal evidence of what is likely to happen this time around. From June 2008 to January 2009, real oil prices dropped by 68% during the recession. While the rest of the nation fell off an economic cliff, Texas withstood this dual threat relatively well with total employment never falling on an annual basis. In fact, it increased by 3,043 in 2009. So much for the collapse of the Texas model. The current test on the state’s economy will depend on how low oil prices go and for how long. After real oil prices hit their lows in early 2009, they rose relatively quickly throughout the rest of the year, contributing to the lack of economic decline. This time around is also different with the rest of the nation growing—though at a sluggish pace—providing a boost for Texas. The drop in oil prices may make regions across Texas feel like they’re in a recession, such as in Midland and Houston, but to avoid this and help strengthen the Texas model, Texas legislature should take bold steps to reduce the footprint of government by effectively limiting spending and providing tax relief. Recently, the Texas comptroller provided revenue estimates for the state’s upcoming two-year budget period. Lower oil prices were part of the calculation that range from $64 to $70 per barrel (consistent with the Energy Information Administration’s forecasts,) compared with $80 per barrel during the current budget period. This lowers oil production and regulation tax revenue estimates by 14.3% next period. Independently, this reduces the amount available for tax relief; however, lower oil prices translate into lower gasoline prices. The average regular gasoline price in Texas is roughly half what it was last summer at $1.85 per gallon today according to Gasbuddy.com. With more money in Texans’ pockets from paying less at the pump, they can allocate these savings as they see fit. Spending on other goods and services is expected to generate 8.9% more sales tax revenue, which is 55% of total state revenue. Purchases of new vehicles and more gasoline, driven by the lower price at the pump, are forecast to increase their related taxes by 14.6% and 4.3%, respectively. Collectively, total general revenue is estimated to increase during the next budget period by $10 billion. These additional dollars in the state’s coffers could amount to $3 to $5 billion available for tax relief. This would be the best path forward to continue the overwhelming success of the Texas model and put to rest the failed arguments by critics.